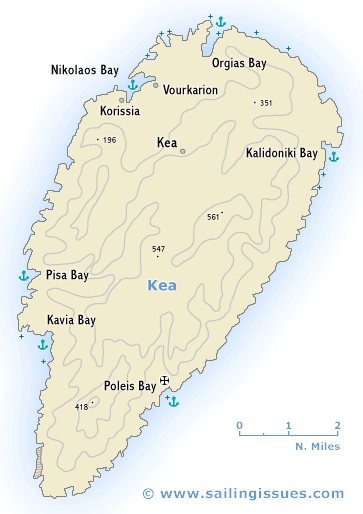 The island of Kea - Κέα or Tzia - Τζια, the most westerly of the larger Cyclades, lies some 12 nm south-east of Cape Sounion. The island's agriculture and the traditional harvesting of acorns for use in tanning have declined as a result of emigration. There is a certain amount of tourist traffic from the Greek mainland. On the south side of Nikolaos Bay - which was a pirate stronghold in the 13th c. - is the little port of Korissia (also known as Livadi), built on the side of ancient Koressia. There are remains of the ancient town walls and a Sanctuary of Apollo. The Kouros (statue of a youth) of Kea (530 BCE) which was found here is now in the National Archaeological Museum in Athens. North of Korissia, at the seaside resort of Vourkari, stands the little Church of St Irini, amid the remains of a strongly fortified ancient city (3rd millenium BCE - 3rd c. AD), including the oldest temple found in Greece. (15th c. BCE). The famous lion - carved from the native rock in the 6th c. BCE - can be seen just north-east of Kea town. And another highlight is the beautiful anchorage of Poleis. Originally settled by Dryopes from Evia and later by Ionians, the island was known in antiquity as Keos and was a tetrapolis - a State comprising the four cities of Ioulis, Karthaia, Koressia and Poiessa. The chief place on the island, Kea lies at on the site of ancient Ioulis, of which there are some remains within the medieval Kastro (1210). Ioulis was the home of two notable poets, Simonides and his nephew Bakchylides (6th-5th c. BCE). Near the above mentioned anchorage of Poleis are the remains of the massive terrace walls of ancient Karthaia. On the lowest of the terraces are the foundations of a Doric Temple of Apollo. Athens and especially Lavrion are the most convenient yacht charter bases to start your sailing holiday and visit Kea and the other northern Cycladic islands. Paros and Syros are the other two (smaller) charter bases in the region. Prehistoric settlement of Aghia Eirene, walking distance from Poleis (Polis) anchorage. And the Tower of Aghia Marina near Kea Chora, a free-standing and five-storeyed square defense tower 10 by 10 metres and around 20 m. high.